Men, sé Romen ta-a fou-dekdek! Editions in French based Creole languages. Gran kannal la  (4.2008) map! 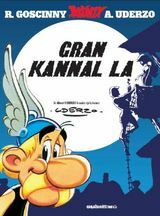 Gran kannal is translated in the Creole of Guadeloupe and Martinique, islands of the French Antilles. Yann writes: The translators have used one variant for each character for the presentation page: Asterix is Guyane créole, Obelix is Guadeloupe, Panoramix is Haiti, Balakadrix is Saintes, Majorix is Martinique. In the story, the right part of the village speaks Guadeloupe creole and the left side Martique creole. Asterix village speaks a mix of both (but basically Martiniquais).